Physicians Formula has no chill, and launched so many new products at once that they might just have given me whiplash. I gave you a major sneak peek a couple months ago with their Healthy Lip Liquid Lipsticks, which were big winners in my book. 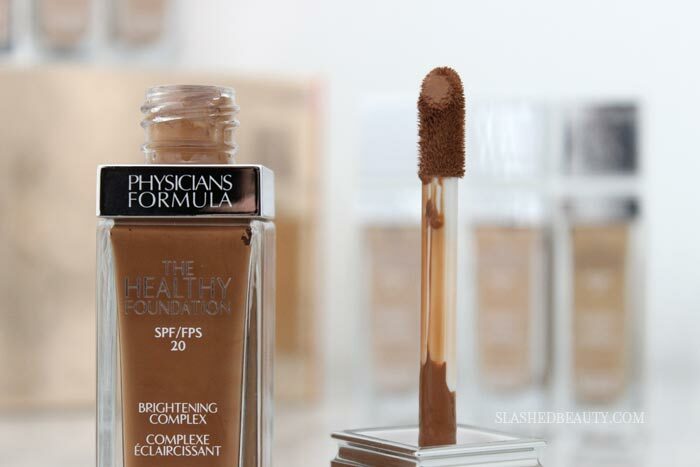 They quickly became some of my favorites for fall… but may have to share the spotlight now that The Healthy Foundation is available. This post was originally photographed without the Deep shades, but has since been updated to include their swatches, as well. 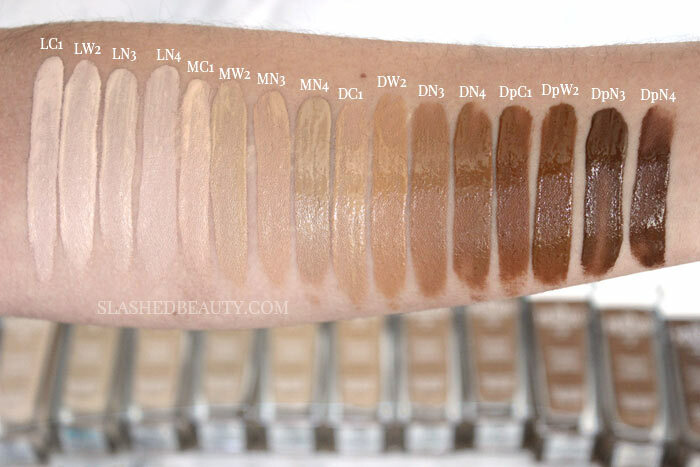 I think it is important to note the shade range of this collection’s first release, because one of the biggest criticisms you hear about Physicians Formula is their lack of shades for deep skin tones. 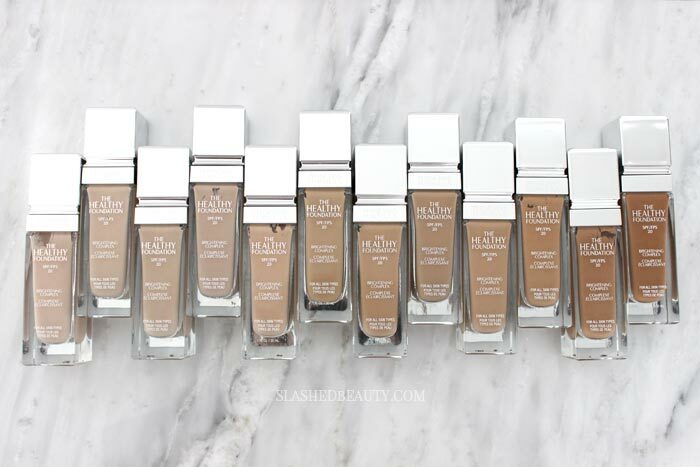 I feel like their opening range of The Healthy Foundation shades is an answer to that, as there are a total of 16— from pretty pale to the darkest I’ve ever seen the brand venture into. I think it’s a great step in the right direction and hope they continue with this effort. They’ve already released two darker shades of the Butter Bronzer as well! 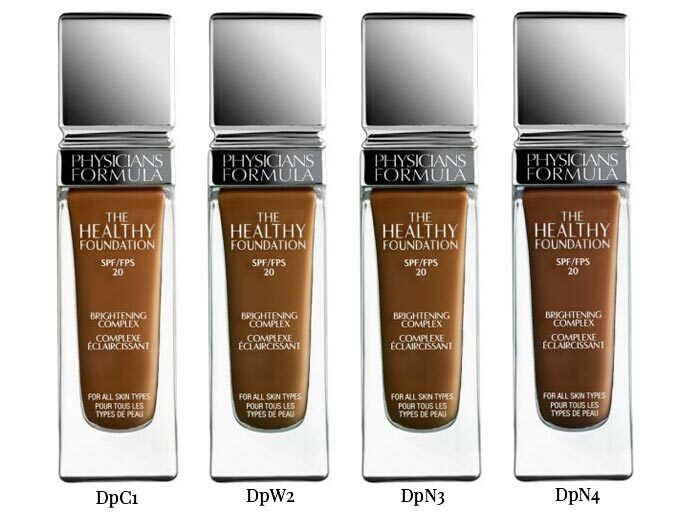 The Healthy Foundation is a long-wearing and buildable foundation with all sorts of good-for-your-skin ingredients in the formula. With a brightening complex and hyaluronic acid, it’s supposed to improve the appearance of skin tone. Vitamins A, C & E help hydrate and nourish, while SPF 20 protects from the rays. The first thing I enjoyed about this foundation was the packaging. The bottle is incredibly sleek and looks luxe. I was also really excited to find the soft wand applicator attached to the cap. We’re seeing this a little more frequently in drugstore foundations now, with what’s similar to a really big lipgloss applicator: a soft pointed tip with a product reservoir to help pick up and dispense product on the face. Here’s the tricky thing: this foundation oxidizes. The photo above shows the same shade at two points of application. The top swatch is after about two minutes of drying. The bottom swatch is when it’s freshly applied. You can see that it ends up drying down significantly darker… however, the final shade looks very similar to what you see on the bottle. Coverage is buildable with this foundation, teetering the border of medium/full. As you can see in the before photo, I have some pretty bad blemishes (thanks hormones!) that are super red and irritated right now. With a few layers, I felt like they were VERY well covered but I could still see faint discoloration coming through. Above, the only product I’ve applied is the foundation. Later I did another test with color correcting concealer which really made all the difference. The finish is probably my favorite on the drugstore level. It has an incredibly natural demi-matte look. You get a soft radiance, but it doesn’t even come close to reaching dewy territory. I have a few serious dry patches that the foundation catches after it dries down, but otherwise I can see this foundation working on most skin types. I got more than 9 hours of solid wear time out of this foundation before I started to see those prominent blemishes show through. That’s pretty damn great if you ask me. Again, using color correcting concealer definitely helped the longevity of the coverage. Other face products like blush, bronzer and highlight all apply very smoothly on top and stay that way throughout the day. I often find some liquid foundations breaking up my powder products as hours pass, but not with this one. At $14.99, I’m very happy with every aspect of this foundation. It’s competitive in terms of drugstore foundation pricing at the moment, with some features that definitely make it a great every-day choice. 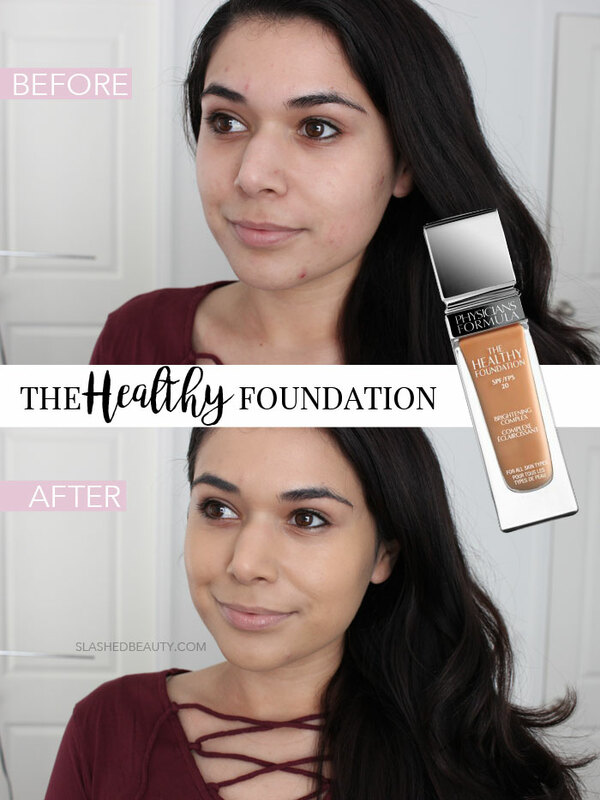 You can find The Healthy Foundation now on the Ulta Beauty’s website and in drugstores nationwide over the next few months. 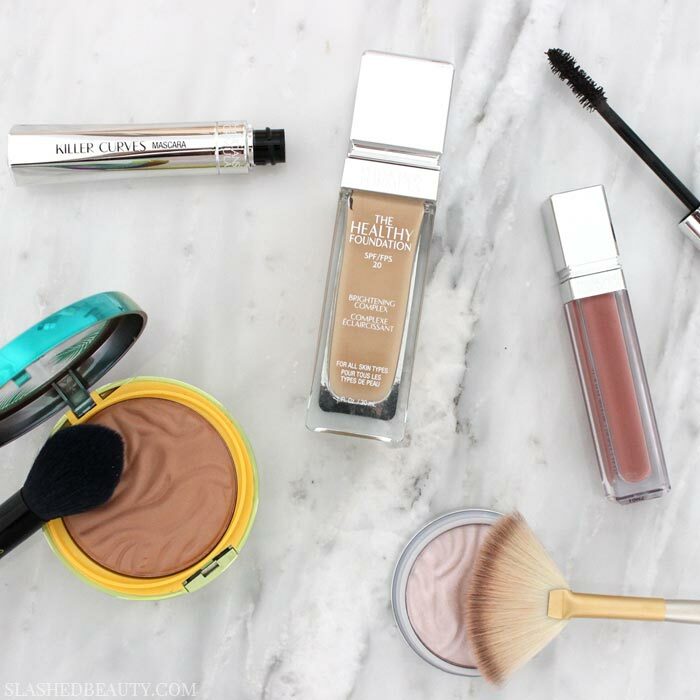 What do you think of Physicians Formula’s new launches? When it dries down is it too orange or just too dark? I feel it looks too dark on my skin after it dries down. What shade did you use in this review? It looks amazing on you!! I’m Asian with light-medium skin with warm undertone ~ NC25 in MAC, do you think MW2 would be too dark for me? I’m afraid LW2 would be too light >< Thank you so much!! Just looking at swatches, MW2 should work for you! As soon as this launched I looked at it but just wasn’t sure until I saw this review. The finish is absolutely gorgeous on you! I have actually been loving their Healthy Skin Foundation but I have been noticing that recently it has been settling into the fine lines around my eyes. 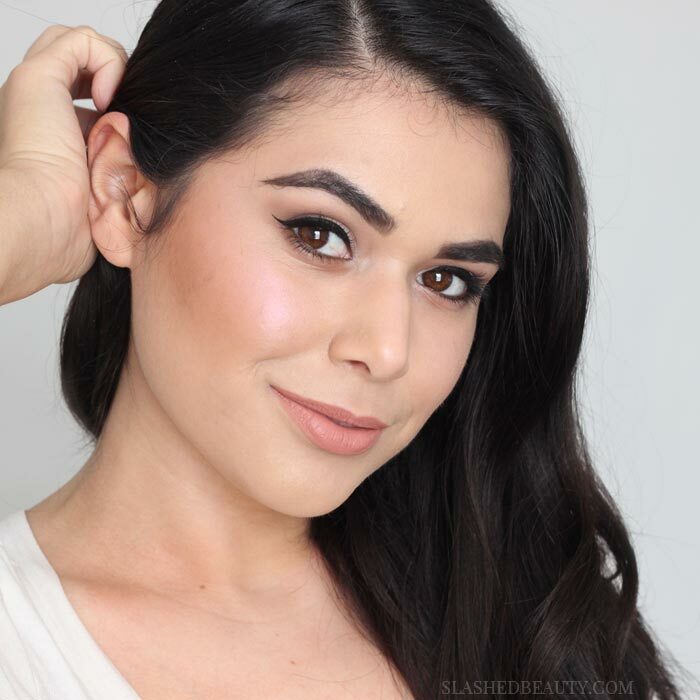 Demi-matte yet leaves a soft radiance? 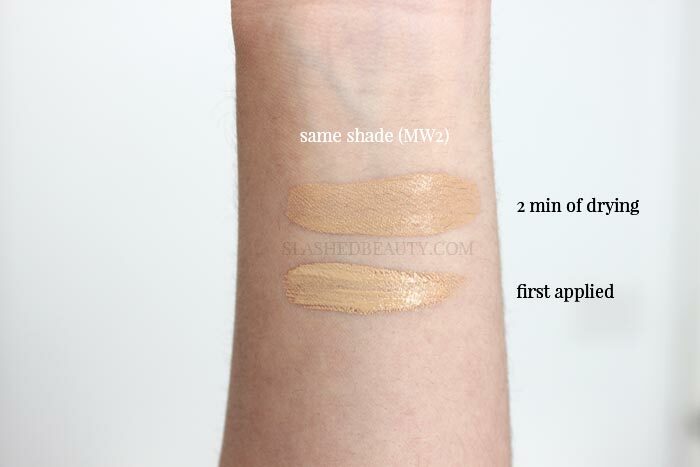 I’m wondering for dry/normal skin if it’ll do also the oxidation makes it challenging to choose shade i guess will go for the lighter first two shades and expect to get a bit darker? But overall sounds good for skin I’d love to try it! I would say yes, it works well with dry/normal skin because I have dry patches right now and while the foundation catches slightly, it’s not extremely noticeable and it doesn’t flake off. And I would say thatthe color you see on the bottle is very very close to what you get dried. But buy it from some place like CVS that takes beauty returns no questions asked so you can return what doesn’t match you! I love the demi-matte finish on you, and it looks like there’s great coverage! Bummer that it oxidises; that tends to cause confusion while choosing a shade. Yes I agree. However luckily I feel the final shade matches what’s on the bottle very closely. It has such good coverage! I’m dying to try it now! Indeed! Especially since I clearly have stubborn breakouts right now and it did a pretty good job! It sounds like a finish I’d really like. You look beautiful in it. There is so much PF on my wishlist right now! This looks wonderful on you. I’m surprised how much it oxidizes. I think though I’d be LN3 in it. CVS always has specials on PF so I’d consider it but I really need to know if this has a fragrance. I love my PF eyeliner but I can’t wear their blushes etc because of fragrance. Yes, and CVS has a great return policy if you need to exchange the shade. I’m so disappointed that they don’t have a shade that will match me! You look beautiful in the foundation. Honestly the pale shades are VERY pale. I’d love to see you try! You look fabulous with this foundation! I M glad to see they have deeper shades, too. I was very impressed! I’m curious to test it again in warmer weather. Wow. PF is really stepping out with this packaging. It looks very chi-chi . I agree! I really like it– it feels more high end but the price is competitive compared to other drugstore foundations out there right now.